Add a date stamp to your photos. Select multiple photos in the app, take a new photo, or use the Photos app plug-in to stamp your pictures. With many fonts, colors, and various styles to choose from, you can get just the look you want. If at any time you would like to change or remove the date stamp applied to your photo, you can! Because edits are revertible, there's no need to duplicate all your photos to preserve the original. DateStamper simply applies text overtop your original images. 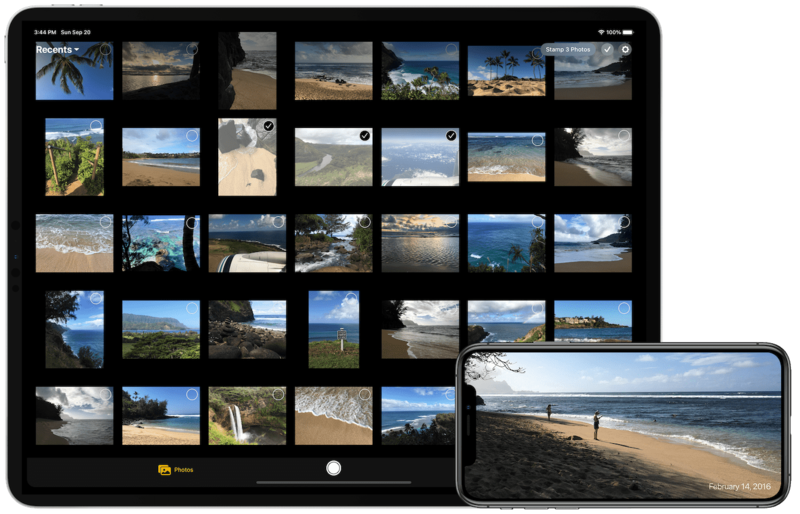 With iCloud Photo Library, when you apply a date stamp on one device, it will appear on all your other devices automatically. How do I date stamp my photos? Select your desired photos by tapping the empty circle in the corner of each photo's thumbnail, then tap the Stamp # Photos button. I have a lot of photos I’d like to stamp. Is there a faster way to select them or do I need to select each one individually? There is! You can simply swipe across the photos to select them. Or you may use the Select Range option to select the first photo, then select the last photo, and all photos in-between will be selected. There’s also a Select All option that will select all photos in your current album. How do I stamp a photo in the Photos app? Simply tap Edit when viewing the photo, then tap the plug-ins button. If you don't see DateStamper in the list of apps, tap More and flip the switch for DateStamper. Select DateStamper to see a preview of the photo with the date stamp style applied, then tap Done. Can I stamp Live Photos? Yes. A date stamp will be applied to the still photo, deferring to the live photo when played. Note however that if you apply the stamp inside the Photos app the Live Photo will be turned off. This can be reverted at any time and the Live Photo will be enabled again. Can new photos be date stamped automatically? Photos taken using the camera within the DateStamper app will be saved with the stamp already applied. Photos taken with the Camera app cannot be automatically edited by third-party apps. Will stamping my photos degrade their quality or remove their metadata? No, the original photo and its metadata is preserved. Text is simply rendered on top. If I stamp my photos, will they be changed permanently? Nope! At any time in the future you may change the style and date format or remove it entirely. How do I remove the date stamp? When viewing the photo, simply tap the revert icon at the top left. You can also revert in the Photos app by tapping Edit then Revert. Note that this will remove all edits applied to the photo. Do I have to revert the photo to the original before I can apply a different style or date format? No, if you stamp a photo that has already been stamped, it will replace the previous stamp with a new date stamp. How does DateStamper know what date to stamp? DateStamper uses the Date Taken metadata from each photo. If that date is not available it will use the date the photo was created. Can I change the date a photo was taken? Yes. When viewing the photo full-screen in the DateStamper app, tap the clock icon, select the desired date, then tap Change Date. Now when you stamp the photo it will use that new date. If I've already stamped a photo and now want to change the date, how can I do that? First revert the photo, then change the date, and then you can stamp the photo again with the new date. How many photos can I stamp at the same time? You can stamp up to 10 photos at once. If you would like to stamp more than 10 per batch, Unlimited Batch is available via an in-app purchase which will allow you to stamp as many photos as you’d like. If you have a lot of photos to stamp, it is recommended to stamp a maximum of a few hundred at a time to avoid memory constraints. Why are some photos colored red? Some photos cannot be edited and are tinted red. For example, photos synced with iTunes cannot be edited. To stamp these photos, you may duplicate them to create editable versions. I want to change some style options but it won't let me, why is that? Some options are unavailable depending on the selected style. For example, Vibrant doesn't allow Text Color customization because its color is determined by the underlying colors in the photograph. The Solid style allows you to customize all options. It seems to be stuck preparing to stamp a photo, why is that? If you have iCloud Photo Library enabled, it may take a while to download the photo before it can be stamped. Please ensure you have a good internet connection. Additionally, the larger the photo the longer it will take to process. Please give it some time and it will complete processing or inform you if an error occurs. When I transfer photos to my computer the date stamp isn't preserved, why is this? Some methods of transferring photos to a computer do not preserve edits made - only the original version may be transferred. For more information see this Apple Support Document. These methods will preserve the date stamp: AirDrop, iCloud Photo Library, iCloud Photo Sharing, other cloud services like Dropbox, or email. Or you can create a non-edited copy of the photo which can then be transferred. To do this, view the photo full-screen, tap the share button, then Save Image. The new photo is placed at the end of your photo library with all edits applied. When I print my photos the date stamp isn't preserved, why is this? Some printing services may not support edited photos and may only utilize the original photos. To work around this, you may transfer the photos to a computer or USB drive and upload them from there. Or you can create a non-edited copy of the photo which can then be printed. To do this, view the photo full-screen, tap the share button, then Save Image. The new photo is placed at the end of your photo library with all edits applied. If I purchase Unlimited Batch or Premium Styles once, must I purchase it again on my other devices? What if I delete the app and install it again, will I need to purchase it again? Nope! If the in-app purchase has been purchased before, you will not be charged again. Just choose Restore Purchase in the alert that appears, then sign in with the same Apple ID you previously used to purchase it. Will you be adding more fonts and styles to choose from? Sure! Let me know if you would like to see anything specific. Will you localize the app in my language? I would love to. The problem is I don’t speak it. If you would like to help localize the app, please contact me. How can I contact you for any questions, comments, or feedback? Please use the Contact, Email, or Twitter buttons located at the bottom of this page. I'm looking forward to hearing from you! How can I thank you for creating this awesome app? If you enjoy using DateStamper and find it useful, please leave a review on the App Store! They are greatly appreciated. Is there somewhere I can go to get updates about DateStamper and other apps you're developing? Sure! Follow me on Twitter, some good stuff is posted there.